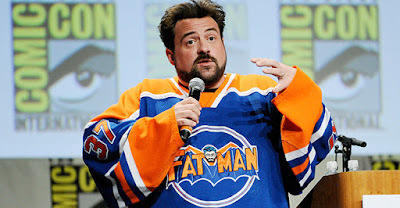 Kevin Smith is teasing the biggest project of his career, one that has fans speculating he may have finally made the jump to a Star Wars, Marvel, or DC film. Following on his annual Comic-Con gab fest, Smith hit social media to say that he's completed scripting on what could be his biggest-budgeted film since Jersey Girl in 2004. Yeah, he doesn't really do big budgets, does he? I wasn't kidding, by the way. Smith's most expensive movie was the dramedy Jersey Girl, which somehow cost $35M. That was well outside the View Askew indie films Smith built his career on, including Clerks, Chasing Amy, Dogma, Mallrats, and Jay & Silent Bob Strike Back. The easy guess is the DC Universe, which Smith has a pretty close association with already. He's been directing episodes of CW's The Flash and Supergirl, and has written his share of DC comics in the past. Is it too much to hope Smith is taking another crack at a Superman movie?